Walter was born in mid 1869, the son of Samuel Lawrence and his wife Harriet (née Forster). Samuel was a publican, or rather a beerhouse-keeper. 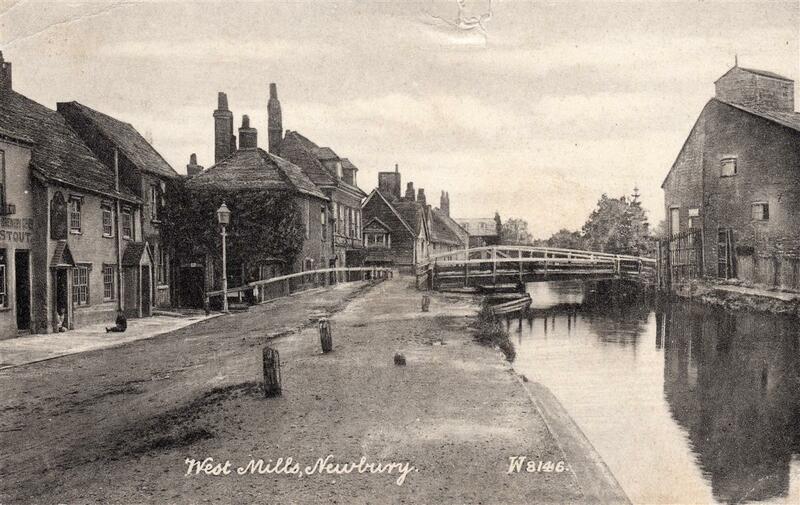 He was landlord of the Crown, a small beerhouse alongside the canal at West Mills, Newbury, sandwiched between two almshouses. It is unlikely that the beerhouse would be the sole source of the family income, because most beerhouse-keepers had another occupation; in Samuel’s case it was chair-making, a local cottage industry with a long association with the Crown (Samuel’s successor as landlord, Albert Lipscombe, was another chairmaker); between them they kept the Crown for over 40 years. In 1877 Samuel moved from the Crown to a house in West Fields, an area that was then starting to be developed for housing. They lived at 2 Speen View Terrace in what was to become Russell Road; when street numbering was introduced in the 1920s 2 Speen View Terrace became 16 Russell Road. Samuel continued to work as a chairmaker until he became to ill too continue; he died in 1899. Walter lived at home until he was in his 40s; according to the 1911 census he was still single at that date (April 1911). However his marriage (to Edith Grant) appears to have been registered in the last quarter of 1910 – and it took place in Kensington, London. Was it a secret marriage? If so, for what reason? One possible reason would be that Edith was in domestic service in London with employers who would not approve; however, this is a no reason not to be accurate on the census. Of course it could have been a different Walter Lawrence and Edith Grant; in which case the marriage of Walter and Edith was not registered, casting doubt that it ever took place. On balance the Kensington marriage looks more likely. Throughout his working life Walter worked as a gardener for Thomas Fielder at Enborne House; not far from Speen View Terrace, so Walter would have had no incentive to move closer to work. Working there for over 30 years, Walter would have risen from gardener’s boy to head gardener (though it was not that large a garden, so there were probably only one or two gardeners and a boy). Nevertheless, he was highly esteemed by Mr Fielder, a well-to-do Newbury grocer. At the same time he was rising through the ranks of the local Volunteers which he had joined as a youth. He rose to the rank of Colour-Sergeant, the highest non-commissioned rank available, and was key to the organisation and smooth running of the Newbury Company of the 4th (Territorial) Battalion, Royal Berks into which the Volunteers were reorganised in 1908. He was also very active in the Guildhall Club, a sporting and educational organisation for young men, acting as Chairman for a period. 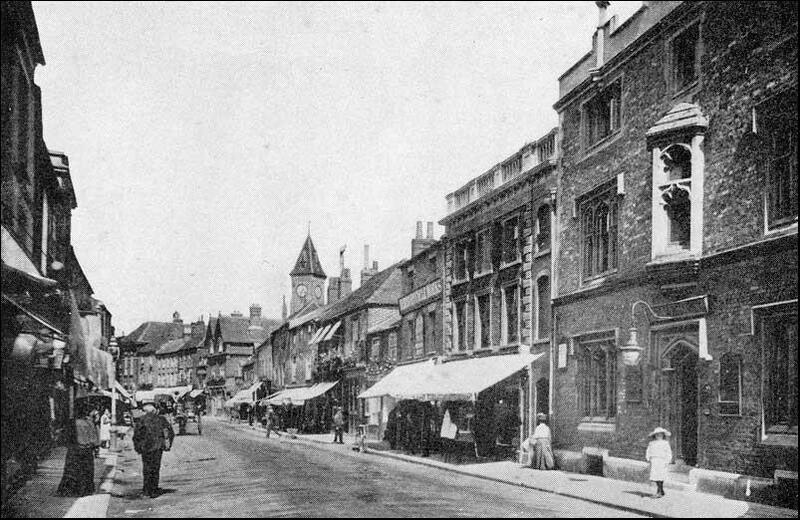 His positions in the Territorials and at the Guildhall Club made him a well-known local figure, and a popular one; he was known locally as ‘Smiler’. At the outbreak of war the Territorials were quickly mobilised and those who volunteered for foreign service were formed into a separate battalion (the 1st/4th Battalion, Royal Berkshire Regiment. The battalion was organised into a typical four company battalion, Walter being appointed a Company Sergeant Major. Colour-sergeant Walter Lawrence, home for a few days on leave, reports the Newbury Company of the 4th Berks Territorials, at Chelmsford, to be in the best of health and good spirits. They are all very fit, 160 strong, and longing for the time when opportunity comes to show how well they can uphold the traditions of the Royal Country, already so gallantly done by the Berkshire boys at the front. Though a little early this may even have been Walter's embarkation leave (often granted to all ranks in batches over a period prior to departure for the Front); the 1/4th Berks landed in France on 30 March 1915. Through 1915 and into 1916 the 1/4th Battalion grew accustomed to the trials and tribulations of a front line unit; men were lost to shellfire, sniping and sickness but, apart from occasional patrols they took no part in any significant action. Their most notable casualty was Lt Poulton-Palmer, England’s charismatic rugby captain - Ronnie Poulton, as he was known to his thousands of fans, was killed by a sniper near Ploegsteert (Plug Street) Wood. On 8 February 1916 Walter was with his company in billets about 1,000 yards behind the front line; the house being used as a Sergeants’ Mess contained a cellar, in which the occupants took shelter when enemy shells began to fall around them. When the shelling stopped, Walter and his orderly, Barrett, emerged from the cellar; just as the shelling started again. A shell hit the house, killing Walter and wounding his orderly. The news which became known on Saturday night of the death of Company-Sergeant-Major Walter Lawrence evoked the greatest sympathy and sorrow. The casualty seemed to bring home afresh the awfulness of war. Walter Lawrence was Newbury born and bred, with a host of friends, who were greatly distressed to hear of his tragic end. The circumstances, as far as known at present, are that the death took place on Tuesday afternoon, February 8th. The B Company of the 1/4th Royal Berks (Territorial) Battalion was in a village about a thousand yards behind the trenches, just having been relieved by another company. 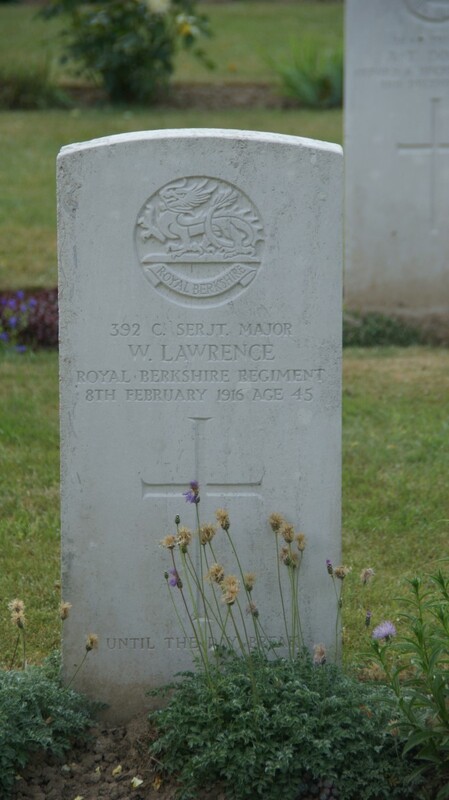 CSM Lawrence was in a house used as a sergeants’ mess when a shell fell and killed him instantaneously, wounding his orderly (Barrett of Caversham) in the arm. The enemy had been shelling the village intermittently, and, according to an officer’s description, the CSM had just come up from the cellar during a lull, when he was killed by a shell that came through the roof of his billet. It was comforting to known that the end was sharp and sudden. It was a soldier’s death, although it did not occur in the fury of battle, but away from the front firing-line. He was given a soldier’s funeral, officers and men attending to pay the last tributes to one respected by all alike. 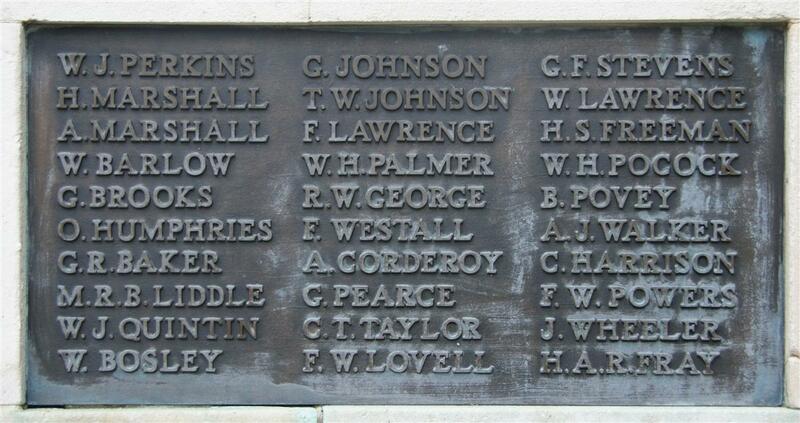 Among them were Sergt Wickens and Pte Alban Giles, of Newbury, who acted as bearers. Extracts from letters received by the widow afford abundant testimony of the esteem and respect in which her husband was held. Walter Lawrence was a gardener by civil occupation, and had been in the service of Mr T W Fielder, of Enborne House, for over 30 years, and by whom he was held in great respect. He was always keen on military matters and joined the Volunteers as a young fellow. He was diligent at drill, and rose through the ranks to Colour-Sergeant, at that time the highest post for a non-commissioned officer. He rendered great service to the Newbury Company, being particularly active as secretary to the prize fund, which he succeeded in maintaining at a generous amount. In August 1914, he answered the call with the rest of his comrades of the E Company, and went on a period of training at Chelmsford. In March 1915 the 1/4th Royal Berks went to France and Lawrence went with them, his rank being that of a second-class warrant officer, Company-sergeant-major. He was home in July on a short leave, and was then in very cheerful mood, fully justifying the familiar name of “Smiler,” ny which he was known amongst intimate friends. He refused to say “Good-bye,” being confident that he would be returning to his old home, Alas! that it should not be so. He was expected on leave this week, but instead he lies in the Cemetery of a little French village and a wife and aged widowed mother are stricken with sorrow. The deceased was 44 years of age, and was son of the late Samuel Lawrence of West Mills, and Mrs Lawrence, of Speen-view-terrace. He married Miss Grant about five years ago. He was an Oddfellow and a National Depositor. He had long been identified with the Guildhall Club, occupying the post of chairman, and generally using his best efforts to promote the welfare of this institution for young men. His death is keenly felt by all to whom he was known. 8 February 1916 - Working parties as usual, morning only. A and C Companies relieved B and D Companies by 3.30p.m. At 7.50a.m. their guns began firing and did not cease until dark, the shells falling chiefly in the village, Brickfields and No Road. All their guns were firing, from Field Guns to 8.2's and there was a most marked absence of "duds". Their shooting was most accurate. A very trying day - about 3,000 shells were fired on the Brigade front during the day. A patrol in charge of Lieut Teed went out at 9.0p.m. from "M" sap, returing about 11.0p.m. They reconnoitred the front of our right section, but all seemed quite quiet. Weather:- a fine day, with rain at night. Remarks Casualties:- 1 killed and 1 wounded. Coy SM Laurence's death was a great loss to his Coy and the Battalion. His first thought was for the men and he grearly endeared himself to all ranks. 2Lt Austin-Leigh went on a Bombing Course. Casualty: 1 wounded, (shell shock). Such tributes are rare for the death of an officer, even to name an 'other rank' is unusual; this probably reflects an exceptionallyy high regard for Walter, but could be a result the relatively easy time the Battalion had had up to this date. 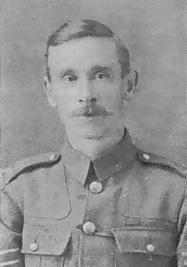 Walter was buried in Hebuterne Military Cemetery in the area that was to become infamous a few months later – the Somme. He is remembered locally on the Newbury Town War Memorial and on the parish memorial board and roll of honour in St Nicolas’ Church, Newbury.